Making your shop windows and in-store displays “Instagram-worthy” can lead to some free PR on social media, and also give you some great images to post. One way to pull your visual merchandising together is to work with a theme — and there are more options available for this than you might think. If your store sells holiday decor, you undoubtedly do displays that feature Santa and other Christmas traditions. 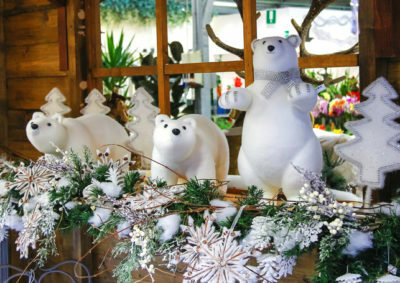 It’s fun to mix it up a bit, such as the polar bear theme above from the garden center Mondoverde in Taneto, Italy. The time and place suggest Christmas, but the merchandise being sold could just as easily be used in a ski lodge or on a mantle throughout the winter. You can also use repetition of your own merchandise, perhaps in different sizes, to make a strong visual statement. A window filled with antique trunks instead of an assortment of antique items sends a clearer message to the casual viewer, and could be used to show off the different ways trunks can be used in a home. Color is perhaps the easiest theme to use to coordinate merchandise that may not otherwise go together. Trying pulling together a grouping of red and white items, for example. It doesn’t hurt to use a bit of whimsy to pair things that wouldn’t normally go together. But by cross-merchandising color-grouped items that could be combined, you will give your customers some fresh gift ideas. Those of you who are a bit older may remember that there actually is a theme song for store displays: How Much is That Doggie in the Window. The song is a bit dated (it is, after all, over 65 years old), but it does celebrate the fact a consumer has been inspired by a display to want to make a purchase. And that is the whole purpose of visual merchandising, isn’t it?